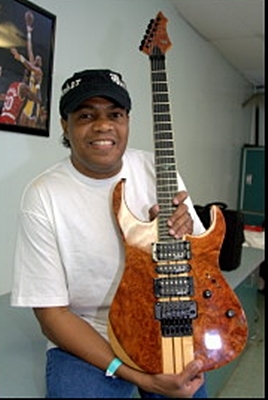 Legendary guitarist, composer and producer, AMIR – SALAAM BAYYAN of KOOL AND THE GANG will be playing RWG guitars on the band’s tour with Van Halen. Kool and The Gang’s guitarist, Amir – Salaam Bayyan is known to audiences world wide for his incredibly expressive, funky and soulful playing. His credits as a composer, engineer and producer include Vanessa Williams, Color Me Bad, Jimmy Cliff, Gloria Gaynor and many more and his silky guitar work has been a cornerstone of the Kool and The Gang sound for many years. So when he needed to expand his arsenal for Kool’s new tour with the recently regrouped Van Halen, RavenWestGuitar would become Amir’s first choice! Founder Of RWG Eric Bergquist explains ” We were all thrilled a true Legend like Amir thought enough of our guitars that he chose to make RWG’s his for this incredible tour with Van Halen” Amir chose the RG6900 birds-eye maple and the RG5200 Ebony, both neck thru instruments feature EMG pickups and black Satin Stealth hardware. He will be taking them on the stage with him nightly, throughout the tour.